So, in case you missed it, there’s a video posted by Alicia Silverstone sweeping the YouTube scene right now. The video shows her feeding her baby, Bear, from her own mouth, much like a mama bird. With 1,532,937 views and counting, there’s no doubt that the video is popular, and in fact, most viewers at her own website, The Kind Life, were supportive and thought this was pretty darn cute, leaving comments like, “Alicia, I had never thought of this before but it’s the cutest way of feeding your baby! I have a 7 month old and I think I will try this method…she is always trying to lick my mouth anyways might as well give her a reward!” Some readers at Silverstone’s blog even commented that this was a “green” practice. But not everyone is on board with mama-to-baby food swapping, for example one YouTube viewer posts, “That is so gross I will never watch another movie with her in it.” Other viewers don’t like that she’s made vegans look odd, as one viewer writes, “Thanks a lot Alicia, for furthering the stereotype of vegan parents as being sick weirdos.” Silverstone, a vegan advocate, is helping to promote the vegan movement with her book and blog, but when it comes to oral hygiene, she may have missed the mark, because feeding your baby from your own mouth is a risky habit. A well-planned and healthy vegan lifestyle may be good for your body and the planet, but just because you’re vegan or a mom, doesn’t mean you should spit swap. For one thing, in contrast to the comment above, not all vegans make healthy food choices. Vegans have the capacity to eat processed junk food, sugar or salads packed with iceberg lettuce just like vegetarians or meat eaters do. Plus, vegans may or may not have good oral health.We should focus on food choices and other healthy choices, not diet styles, when discussing what amounts to a healthy lifestyle. Secondly, vegan or not, spit swapping is not recommended by major health organizations. Almost every mama I know, myself included, has at one point shared a utensil with their baby, but it’s not hygienic to do so. Many studies about cavity causing bacteria being able to pass mouth to mouth have been published over the last three decades. The most highly cited bacteria is streptococcus mutans, a bacteria that can be passed to others if you kiss, share utensils, blow on someone’s food, share a toothbrush, use your mouth to clean off a pacifier or swap food. Mom spit contains more germs than baby spit. When you swap that spit your adult germs may take up residence in your baby’s mouth. Should you freak out? 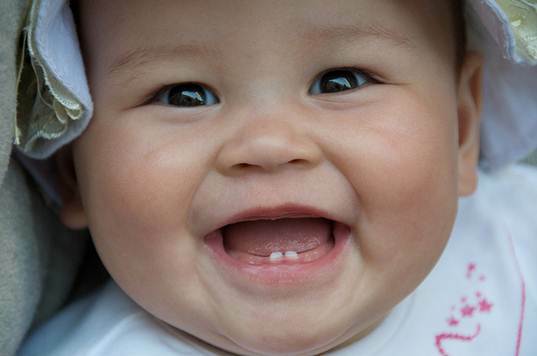 No, because frankly, germs are everywhere, but you should take basic precautions to protect your baby’s gums and teeth and keep them healthy, which means you should brush and floss your own teeth, take care of your little one’s teeth and gums, and no matter how adorable you think it is, you shouldn’t swap spit by chewing your baby’s food for her. Tell us what you think in the comments – is spit swapping or chewing your baby’s food for her a good idea? I think that this is a bad idea, even not considering the health aspects. This child appears to be a toddler. Presumably, he will soon be going to preschool, and later to kindergarten. Young children always share their food, germs or no germs. This child may have some interesting notions when it come to food sharing that rather deviate from the accepted norm. I am concerned about what the child is learning. In addition, the child seems not to like the experience, but is having it forced upon him. So, in case you missed it, there's a video posted by Alicia Silverstone sweeping the YouTube scene right now. The video shows her feeding her baby, Bear, from her own mouth, much like a mama bird. With 1,532,937 views and counting, there's no doubt that the video is popular, and in fact, most viewers at her own website, The Kind Life, were supportive and thought this was pretty darn cute, leaving comments like, "Alicia, I had never thought of this before but it's the cutest way of feeding your baby! I have a 7 month old and I think I will try this method...she is always trying to lick my mouth anyways might as well give her a reward!" Some readers at Silverstone's blog even commented that this was a "green" practice. But not everyone is on board with mama-to-baby food swapping, for example one YouTube viewer posts, "That is so gross I will never watch another movie with her in it." Other viewers don't like that she's made vegans look odd, as one viewer writes, "Thanks a lot Alicia, for furthering the stereotype of vegan parents as being sick weirdos." Silverstone, a vegan advocate, is helping to promote the vegan movement with her book and blog, but when it comes to oral hygiene, she may have missed the mark, because feeding your baby from your own mouth is a risky habit.